Many different styles of coat were available by the late 19th century. These included the Paletot, a short coat that could be worn as a jacket when indoors; the Inverness, a combined coat and cloak; the Ulster, made of a heavy woollen material and worn with a belt and, perhaps the most popular, the Chesterfield, worn long to the knee and not shaped at the waist. The popularity of sporting activities meant that shorter coats were also increasingly worn. Overcoats were usually black or grey - muted tones in keeping with the rest of a gentleman's wardrobe. It was important that it was stylish since an overcoat would be an obvious sign of the wearer's social standing and status. 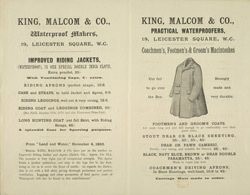 This advertisment features King, Malcom & Company's waterproof clothing.